A stunning Collection of hand-carved rugs made in a time honoured traditional way. 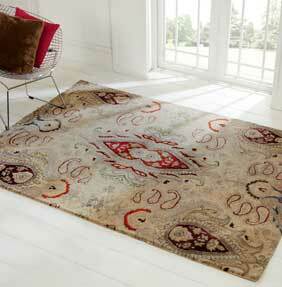 Persian Fusions vintage designs create a contemporary twist on a traditional or floral rug. Persia or Iran as it is now known is renowned for its handmade carpets and rugs, throughout the centuries these rugs have been regarded as the best money can buy. Both designs are hand-woven and heavy in weight, with intricate detailing in a mix of wool & viscose, they reflect quality and style. Adding some decadence to your floor has never been this easy! Soft subtle backgrounds burst to life with vibrant detailing. Two beautiful designs options that have a space dyed effect throughout to give a more textured and intricate look.